A list of the reports, articles, and presentations about defence entities or defence-related topics. Central government: Results of the 2005/06 audits. 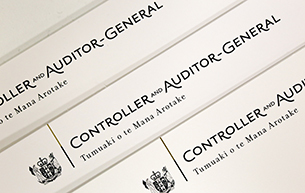 Part 3.5 of a report on the results of the 1999-2000 central government audits. August 1992, ISBN 0 477 02832 2. August 1991, ISBN 0 477 02822 5. August 1990, ISBN 0 477 02816 0.